I went a little crazy and bought a bunch of sweater knits and sweatshirt fleece from Emma One Sock when they were having a sale. I decided to dive into my new fabric with a pattern I've sewn before, Simplicity 8529, the Sew House Seven Toaster sweater with dropped shoulders. This time I went with View D, the cropped crew neck. 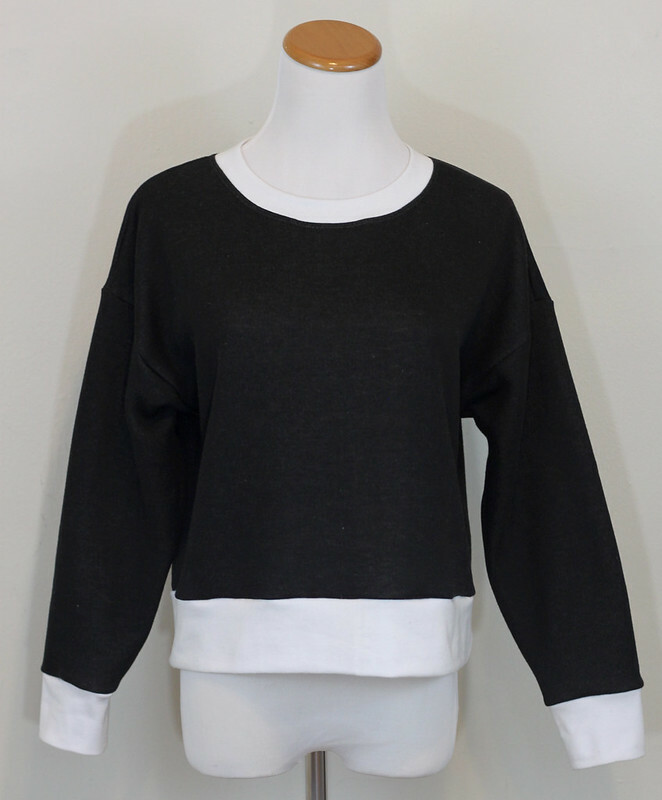 I used a very soft poly/cotton/rayon sweatshirt fleece in black for the main body and some white ribbing from my stash that I'm sure I bought at Joann's ages ago. I thought about trying to find a matching ribbing but that seemed a bit boring. I chose high-contrast bands to give it a sporty modern touch. Because the sizing on my last version was a bit small, I went up to a size S. I shortened the body 1.5" to make it a cropped length and also shortened the sleeves 1.5", which is a bit less than last time. Because I was using a stretchy ribbing, I did remember to actually test the fit of the neckband before I sewed it on and I think I cut off about an inch to make it lay flat. However, I did not do the same on the hem and sleeve bands, and I really should have. My thinking was that I didn't want those areas to be too snug, but they do hang a little loosely for my taste. Next time I would double-check the length before stitching to see if it needs adjusting. The loose ribbing at the bands does make it feel like the garment is too large, if that makes any sense, but I think the sizing is actually fine. I think I will alternate between sewing the size XS and S depending on the stretch of my fabric. It is truly a crop sweatshirt now and I'll have to wear it a few times to decide if I actually prefer the original longer length on me. I bought a bunch of woolly nylon thread to use in my serger/coverstitch to see if it improved the level of garment stretch. Honestly I couldn't detect a big difference, at least on this sweatshirt. One noteworthy thing is that I could not figure out how to thread the looper on my coverstitch. Because woolly nylon is so fluffy there's no way you can thread it through the eye of the looper. I ended up threading it with normal serger thread, tying on the wooly nylon just like I do on my serger, and pulling it through. The garment was almost entirely sewn on my serger. I stitched the band seams on my regular sewing machine just so I could easily change the thread color, and I used my coverstitch for the neckband only. I really love this pattern. It's such a classic make and I have plans to try the longer split hem version as well. I will be back tomorrow with ideas on how to style my new black sweatshirt.